From my brief internet search, the model number you gave is NOT the manufacturer's model. 692-008 is an in-house model # assigned by an equipment distributor - Central Restaurant Products in Indianapolis, Indiana. To answer your question - per the owner/installation manual, there must be 10" of clearance between ALL sides of this unit and any combustibles (like wood). Here's the link to a copy of the installation manual - http://southbendnc.com/downloads/manuals/Current/Ranges/1191904,REV2,S-SERIES,ENG,OWNERS,MANUAL.pdf. Although the picture on its cover doesn't look exactly like your range, yours is one of MANY possible configurations of a S-Series restaurant range. So...this one manual covers them ALL. You said you're remodeling your kitchen. 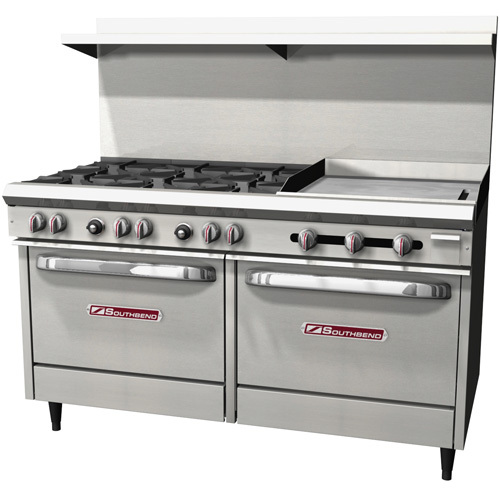 If this kitchen is in a RESIDENCE, then there are distinct issues and legalities regarding the installation of a heavy duty commercial range in a home. The manufacturer's specification sheet for that range states that this unit is for COMMERCIAL USE ONLY. Not for domestic use. Here's the link to a copy of that spec sheet - http://images.centralrestaurant.com/images/assets/specsheets/692-008.pdf. There are reasons why they put that there. In a commercial setting (for which this unit was designed), a fire suppression must be in place. For guidance on proper installation of this commercial-grade range into a home, consult your local government regarding the regulatory codes that apply.